Book review: Ever wondered where good ideas come from? ﻿ Excellent look at ideation and the development of ideas over time. Both theoretical and practical. Key to Johnson’s discussion is the concept of the “adjacent possible.” Simply put, like ideas tend to cluster together. When you bring different clusters together you benefit from ideas in adjacent groups. Ideas bleed into adjacent groups, or spillover, and generate new ideas. 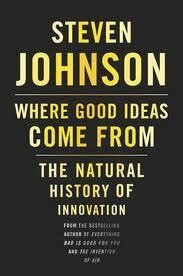 Johnson also debunks the notion of the “eureka moment.” Instead, Johnson shows that new innovative ideas are often born of long held hunches. Those hunches that ruminate in the back of your mind for weeks, months, and even years. According to Johnson, “the secret to organizational inspiration is to build information networks that allow hunches to persist and disperse and recombine.” By creating high density liquid networks, organizations make is easier for innovation to happen. But don’t take my word for it, hear Johnson describe where good ideas come from in his own words. Book review: Grown up Digital (understanding today’s Net Generation). This is Tapscott’s update to Growing up Digital and it attempts to address how the Internet, social networking, and this new world of hyper-connected world is shaping and reshaping today’s “net generation” (i.e., those between 11-31 years old). They’re not as smart as previous generations were at their age (agree with Tapscott, this is not my experience). They’re loosing their social skills (maybe, but isn’t that our job to teach them?). They have no shame (did you when you were that age?). They’re being “coddled” by their parents are unable to make commitments (not sure what that has to do with the Internet). They steal (maybe – it is more anonymous online). They bully their friends online (are there really more bullies or is this just a new approach?). They’re violent (could be, suspect that’s directly related to playing violent games?). They have no work ethic (have heard this from other business owners). They are narcissistic (ahh, their mostly teenagers). They don’t give a damn (not my experience). He spends much of the book debunking each of these issues and uses many examples from research he and others have conducted to bolster his arguments. 1. Net Gener’s brains are wired different. I do agree with Tapscott that Net Geners appear to be able to more easily jump from one topic to another. I also think they are better able to see interconnections between what we old folks might think of as disparate topics. 2. Education must change to accommodate this new way of thinking. Tapscott spends a good deal of time bashing the current education system (especially higher ed) for their antiquated approach to teaching. Tapscott suggests that this new interactive style is driven from Net Gener’s experiences with the Internet and how they learn. I would humbly disagree. What Tapscott describes is just good teaching techniques. It was good teaching 20 years ago when I taught school and I don’t believe it’s changed dramatically. What has changed is the tools that educators can use to make classrooms more dynamic and interactive, and I would add, maybe an expectation on the part of learners that it would be more fun. I’ve always ascribed to the philosophy that learning must be fun and entertaining. I would hope that all educators seek to create a more individualized, interactive approach to teaching such as Tapscott suggests. A deeper look into the data would be helpful. For me, some of Tapscott’s conclusions were too broad based. I wanted to dive deeper into the data and take a more critical view of the conclusions that were drawn. Occasionally Tapscott focused only on the data that supported his conclusions, and overlooked data that might raise more questions. The conclusion I drew from this statement was that while kids may be communicating with more people than ever before, they may be using social media to avoid more personal forms of communication. I don’t see how the amount of time online directly relates to an individual’s ability to “socialize.” It could, in fact, impede it depending on what your definition of “being social” is. Some kids may be using social media to avoid face-to-face interactions. And if that is the case, the “awkwardness” will never go away resulting in an individual who is never able to practice and improve these skills. Bottom line: Interesting read taken with a grain of salt. In general I agreed with Tapscott’s positive assessment of Net Geners. As with all technology, there are positive and negative effects. Technology is shaping Net Geners, but Net Geners are also shaping technology, and often in positive ways. The book is filled with many examples of new and innovative uses for social media/networks, however, I found that many of the points made in earlier chapters are often repeated unnecessarily. It raised many more questions for me, so I’m thankful for that. However, a more critical look at the research might have been more revealing and conclusive. Book review: The New Rules of Marketing PR. The best book I’ve read that deals with the blurring lines between marketing and PR. Scott speaks from knowledge based on a long a history of breaking the rules when it comes to reaching his buyers. Scott’s number one focus is connecting with the buyer and his book is full of examples and great advice that’s easy to digest. Scott recommends developing personas through research and interview with your buyers to help identify their needs, the language they use, and what they’re looking for from your company. The web has opened a whole new world for both companies and buyers. It doesn’t eliminate the need for PR and marketing but it should change how you go about communicating with your buyers. Use personas to understand your audiences’ needs. Look for ways to shift from one-way to two-way communications. Use the web to give your company a voice and create a direct, personal connection with your buyers. And finally, look for agencies who understand and embrace this new world. Ones who can help you navigate and leverage it to your advantage. Scott is speaking at the MarketingProfs B2B conference, up in Boston June 9 -10. Title: Words that Work. It’s not what you say, it’s what people hear. Pub Date: Dec, 2006My colleagues over at the Kauffman Foundation recommended reading this book. Definitely worth a read, and can get through it in a weekend. Frank Luntz, a political consultant and pollster, knows how to pick just the right words to make a compelling case for whatever he’s shelping. He uses lots of examples throughout of how one small word can make a big difference. What I like at Luntz’s approach is that he focuses primarily on the listener (the audience). He tries to get inside their head to hear the message from their perspective, then select just the right words to make his case or get his point across in a way that the audience can hear. What he says isn’t revolutionary – basically your messages must focus on the benefits to your audience and the results you’ll deliver. What is new is the depth with which he understands and explores the individual words we use. “…tell consumers something that gives them a brand new take on an old idea. The combination of surprise and intrigue creates a compelling message.” Your objective is to generate an “I didn’t know that” response. Focus on results not process. For example, Luntz found that “getting value for government” was much better received than “limited government”. One focuses on results the other is process oriented. How to avoid a ticket: Create a hassle-free environment. First, recognize the police officer’s authority and superiority. Turn off your engine, roll down the window, put both hands on the wheel where the cop can see them with your license and registration, and turn on the dome light if it’s dark. Say, “I’m sorry.” Don’t argue or make up excuses. I tried it. It worked. It’s not enough to have the right solution, the best technology, or the only answer. You must present it in a way that convinces your audience that it solves their problem. Create personas for your target customers. They’ll help you focus on what your audience wants and not what you want to tell them. Remember that business people are people first. Write to them, not at them. Simple, straight talk wins out over complex marketing messages. Speak to results first, and how later.